Unified Shipbuilding Corporation will send qualified personnel to India to ascertain the cause of the explosion. Russia's Zvyozdochka shipyard said it's willing to provide assistance to India in the forensic evaluation of the accident which resulted in a fire on board the INS Sindhurakshak, a company spokeswoman said on Wednesday. The submarine sank in the port of Mumbai after midnight on Wednesday, claiming the lives of all 18 crew members. “The Severodvinsk-based company regards the accident as a personal tragedy, as members of the Indian crew lived in Russian families for more than two years,” Zvyozdochka spokeswoman Nadezhda Shcherbinina said. Indian Chief of Naval Staff, D.K. Joshi, said divers who entered the submarine after 12-hour rescue efforts found no survivors. The submarine will now be hoisted to the surface. Preliminary reports said a fire had started during ammunition loading in the torpedo bay which resulted in an explosion. First Deputy Chairman of Russia's Military-Industrial Commission Ivan Kharchenko said the Unified Shipbuilding Corporation (OSK) would send qualified personnel to India to ascertain the cause of the explosion. “The OSK is in contact with India over the matter. It has been suggested that more specialists be sent to help ascertain the cause,” Kharchenko said. On Wednesday morning, OSK director Vladimir Shmakov briefed Deputy Prime Minister Dmitry Rogozin on the accident. The submarine was upgraded and handed over to Indian in January. After the overhaul it logged a mileage equivalent of a round-the-world trip and was preparing to sail out to sea. A group of Zvyozdochka representatives, who are currently in India for technical maintenance and supervision, were not on board when torpedoes were loaded, according to Kharchenko. Most of the submarine is submerged at a depth of 15 metres, except the control cabin. Sindurakshak was constructed in 1997 at the Admiralty Shipyards facility in St Petersburg on commission of the Indian Navy. In 2012 the submarine was overhauled at the Zvyozdochka shipyard in Severodvinsk. The agreement between Zvyozdochka and India’s Defence Ministry was signed in June 2010. In August 2010 the submarine arrived to Severodvinsk. 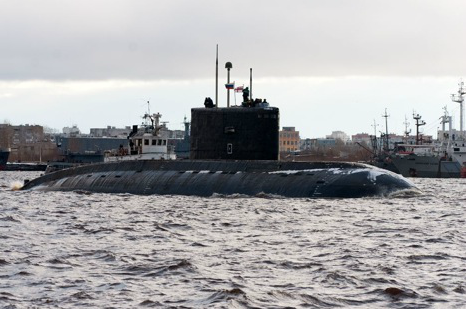 As reported by the shipyard’s press service, the submarine was equipped with a modern missile complex Club-S. Over 10 Indian and foreign systems have been also installed, including Ushus sonar complex and СCS-MK-2 radio communications system. The shipyard has also upgraded the cooling system, installed Porpoise radar set and implemented several other upgrades to boost combat facilities and operation safety of the submarine. In November and December of 2012 the submarine successfully completed the factory test program at the White Sea, which included tests of its torpedo and rocket armaments. This January the Sindurakshak departed from the shipyard to sail to India.